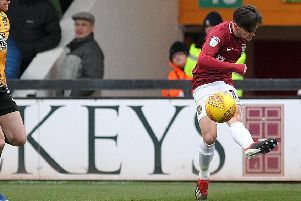 Chris Wilder says he is now 100 per cent happy with the defensive options within the Cobblers squad. The Town boss this week signed Southend United central defender Luke Prosser on loan until the end of the season. Left-sided competition for Rod McDonald is something Wilder has been short of all season, but he now has it and is delighted with his strength in depth for the defensive positions. “You look at it now and we have two for one all over the back four, we have eight defenders,” said Wilder. “We have four centre-halves, which is important. “We talk about us going forward, we score goals, but it is really important we have competition and good players at the other end of the park and we have that. “We have good competition, good experience, and if somebody gets injured then the other players can step in and that part of the game is just as important as the other end. “I always believe that we will score goals, and at times I do get frustrated that we are 3-0 up and want to go and win 4-0 or 5-0! Town now have two right-footed centre-backs in Zander Diamond and Ryan Cresswell, two left-footers in McDonald and Prosser, two right-backs in Brendan Moloney and Josh Lelan, and two left-backs in Dave Buchanan and Evan Horwood, although the latter has yet to play a minute of first-team football this season. “There going to be times when we are going to rely on the back four to get us results, and it is a team effort,” said Wilder. “There are big games coming up and we are going to have to play well all over the park. “We usually play with a back four, so we have two lefties, two right-footers, Diamond and Cresswell can play together, and Josh Lelan and Evan Horwood are pushing Brendan Moloney and Dave Buchanan.